This piece is part of Ting Yuen's Romance Series. This painting is about soul mates. I believe there is a special someone in this world that is specially made for us. Since ducks do mate for life, I have used them as the symbol for Marital Bliss. 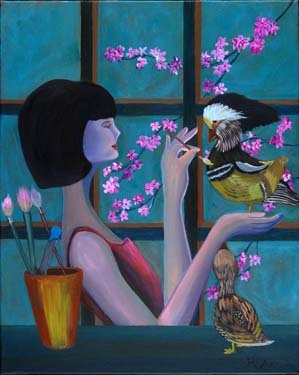 On this painting, the girl is the Goddess, she is creating the male duck for the female duck while she patiently awaits. It's as if God created our partner specially just for us.